Jonathan Nelson's The Woolf of Jonesy: Part I is a treat! In some ways it is (for me) a mirror. See... I grew up on the Nambe Indian reservation in northern New Mexico. 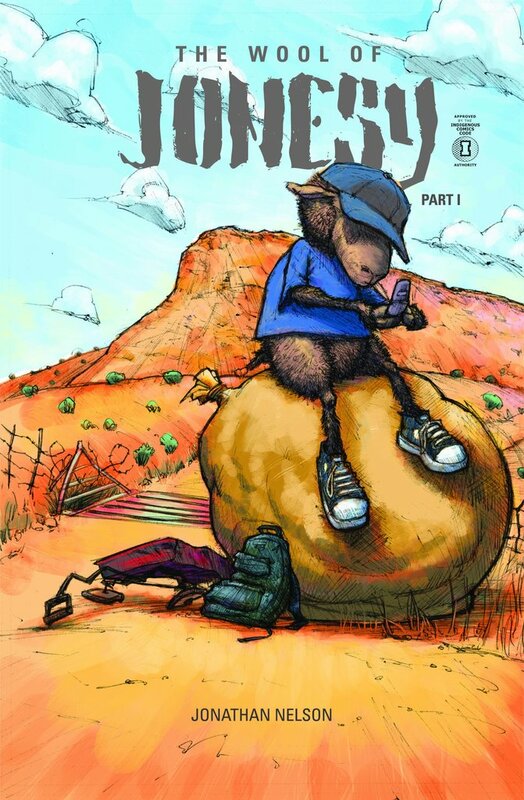 As I gaze at the cover, I see a cool dude (that's Jonesy--he's a sheep) sitting on... something (more on that later). He's holding a flip style phone. On the ground is a little red wagon with bent wheels and a backpack. Behind him is... (imagine me exclaiming) a barbed wire fence and a cattleguard! Silly? Not to me! And certainly not to anyone who grew up on a reservation. Or a ranch, somewhere. Here's how the story starts out: Jonesy has just finished high school. It is springtime. The story opens with Jonesy asleep... and it is getting hot... He doesn't want to get up. Sound familiar?! He reaches over, turns on the electric fan, drifts off again, and the fan quits. He hauls himself out of bed. Compare the sleeping Jonesy in the panel to the Jonesy on the cover... he does, indeed, as that last row shows us, shave his wool. The story then, is his efforts to get that wool to the trading post, where he plans to sell it. At the end of the story, Jonesy is back home, waking up, his bag of wool nearby. As you see in that panel, there is no text. The Wool of Jonesy is a wordless comic. Readers use the images to create the story, themselves. It is like Owly. 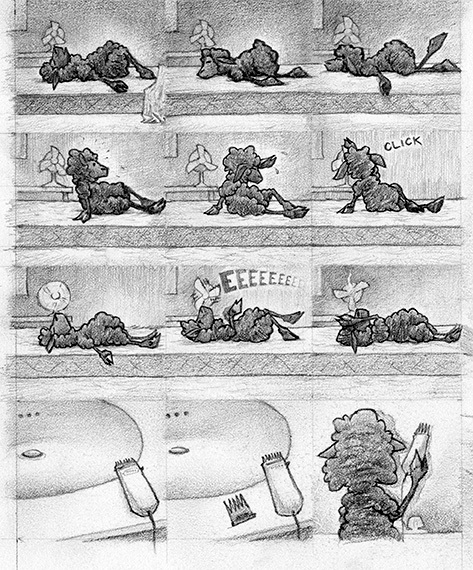 If you're new to wordless comics, or comics in general, take a look at Gene Yang's Graphic Novels in the Classroom from the January 2008 issue of Language Arts. I am pretty sure that I know some librarians and teachers who would love to have this book... As I study it, I see all kinds of things I love (example: it is set in the present day). What is Jonesy going to do... in Part II?! The Wool of Jonesy came out in 2016 from Native Realities. Get your copy directly from Native Realities. Heck! Get two copies and give one to a friend or a kid you know! I highly recommend it! Oh! Follow Nelson on Twitter https://twitter.com/badwinds and check out his website. I've had a couple queries lately, from people asking me about a "Native American Story Book" series by G. W. Mullins. It is easy to say "not recommended" to the series. "I was born Cherokee and as a child heard many of these stories. These stories were passed to me in the old traditional way of my grandfather." His grandfather may, indeed, have told him some stories, but, the first story in Volume Three is Longfellow's "The Song of Hiawatha." That is not a Native story! Longfellow made it up. Does Mullins know it isn't a Native story?! "... a collection of Native American works which are public domain." I looked through a couple of the others, in his series, and find them problematic for many reasons. I do not know why they're popping up right now, but I definitely do not recommend them.